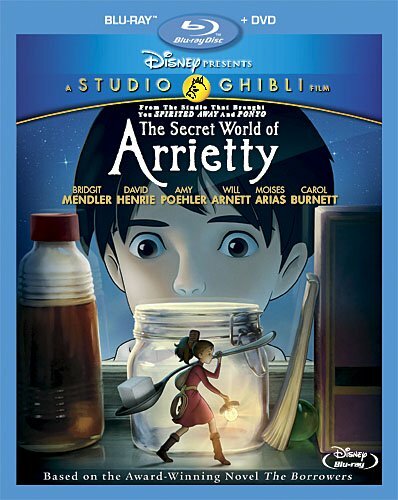 Bryan’s Bluray Review of ‘The Secret World of Arrietty’!!! I heard about ‘The Secret World of Arrietty’ a while ago and really wanted to see it in the theater. Unfortunately, I didn’t get the chance to see it on the big screen, so I was super stoked to see it on bluray. I prefer the undubbed version to the english dubbed film, but it didn’t detract away much, considering the very comedic actors who lend their voices to the english version. ‘The Secret World of Arrietty’ is a very fun story that will appeal to both kids and adults alike. 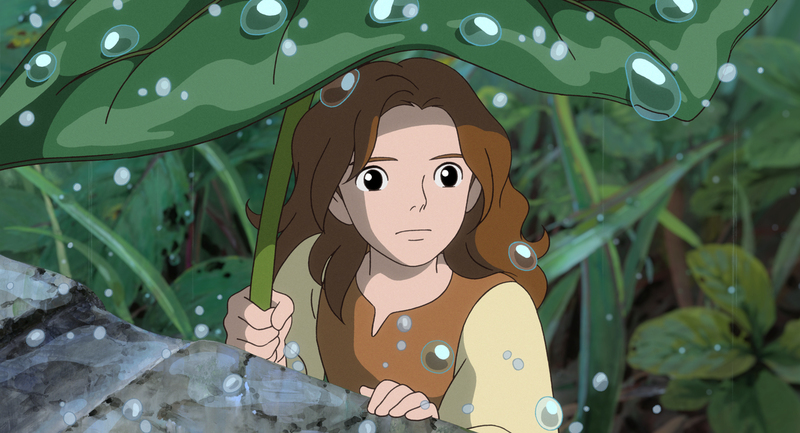 ‘The Secret World of Arrietty’ follows a teenage girl named Arrietty. There is one thing about Arrietty and her family that makes them different than anyone else. They are only a couple inches tall and live underneath floors and in the walls of a beautiful country home. Her people are known as “borrowers’ and have been around a very long time. They usually “borrow” household items for their families to live on, whether it be a cube of sugar, a tooth pick, or a crumb of bread. They are peaceful people and look just like humans, but only a couple of inches tall. The borrowers are not known to regular humans and they want to keep it that way for fear of them being killed or stepped on. One day, a teenage boy named Shawn comes to stay at the house where Arrietty and her family live, because he has severe health problems. He discovers Arrietty in a string of mishaps and the two develop a great friendship. However, their friendship and relationship has hidden dangers for the borrowers that could force Arrietty and her family out of their home. 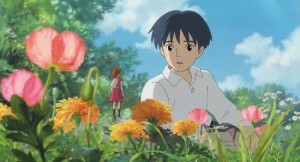 I really enjoyed the story of ‘The Secret World of Arrietty’. It had a lot of heart and adventure to it. However, its execution was slow, dull, and anti-climactic. Scenes seemed to go on forever without really advancing the plot, and every tone and piece of dialogue was dialed down, which was weird because this is partly an adventure film. Amy Poehler and Will Arnett lend their voices to some of the main characters, which was very weird for this type of film since it’s not a comedy. Overall, I think a lot of people will enjoy it, but I don’t plan on watching it much, since it doesn’t have a very big replay factor and it might put me to sleep. ‘The Secret World of Arrietty’ is gorgeous. It has a glorious 1080p HD transfer. It seems it is a flawless transfer with no hints of aliasing, flaws, or artifacting that I noticed. One of the best things I loved about this disc was the colors. A wide variety of colors went into this beautiful looking film and came across as very vibrant and rich. THe blacks were deep and inky and the garden and forest colors were unreal. I could definitely put some of the stills on my wall as art. Overall, a very clear and beautiful picture. Great job on the video presentation. 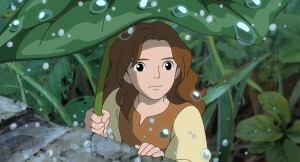 The Audio of ‘The Secret World of Arrietty’ is pretty amazing as well. It has that lossless DTS-HD 5.1 audio mix with the options for the original Japanese track or the dubbed english version. I always prefer the Japanese track to anything. The dialogue was crystal clear without any crackling or fuzz. The ambient sounds of the house creaking, or the animals outside came across all of the speakers very nicely. And the score was phenomenal. I just wish there was more adventurous music and action effects for this film. That being said, this audio track is top notch. Excellent job on bothe video and audio presentations. Storyboard presentation of the film – This extra is sort of a different way to watch the film where we see the sketches that were drawn and how they transferred to the final film. I wish this was in a PiP format. · Original Japanese Trailers and Television Commercials (HD 3 mins) – Original Japanese Trailers. · “Summertime” Music Video Performed by Bridgit Mendler, the speaking voice of Arrietty (HD 4 mins) – If you are a young girl, you will like this. · The Making Of “Summertime” Behind the Scenes (HD 5 mins) – Bridgit Mendler hosts a look at the making of the music video and we see how the music video was made using the green screen. · “Arrietty’s Song” Music Video (HD 4 mins) – Experience the movie’s theme song, performed by innovative singer and harpist Cécile Corbel, who also wrote the lyrics. ‘The Secret World of Arrietty’ is a good film. Not great. But, very good. It could have been better, but I do think this has an audience. The video and audio presentations were top notch. The extras were less than desirable with the exception of the Storyboard feature, which that too could have been improved on. I like that this release comes with both the bluray and DVD. If you can find this for under $20.00, then I say go an buy it. If not, wait for it cable or netflix. This entry was posted on Friday, June 8th, 2012 at 12:46 pm	and is filed under Film, News. You can follow any responses to this entry through the RSS 2.0 feed. You can skip to the end and leave a response. Pinging is currently not allowed. « Coverage on What’s New With the XBOX 360!!! E3 2012!! !